We live in an evolving economic environment, one in which job security and career certainty are distant memories. The old rules for navigating the turbulent waters of employment just don't apply anymore. In the face of these ongoing changes, it's easy to become fearful and discouraged. 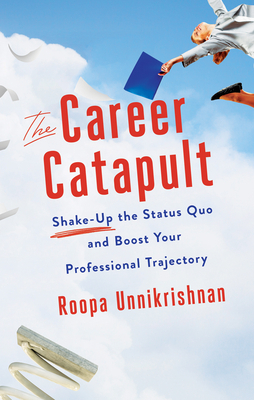 In The Career Catapult, innovative career consultant Roopa Unnikrishnan shows you how to gaze into this uncertain future and shape it to your advantage--regardless of your current position in the job hierarchy. Dig Deep to Soar: Examine your skills and resources to accurately assess your marketplace value. Stalk Innovations and Trends: Explore the context in which you can offer your value. Jolt Your Network: Use your assets, including networks that can drive significant value. Go Extreme: Is your desired future achievable? Yes! Take that confident leap into your future. Roopa Unnikrishnan has spent two decades in roles where she has seeded and driven change and innovation in several Fortune 500 companies. She is a former vice president of corporate strategy and global head of worldwide talent at Pfizer, with previous positions at Blackrock and Citibank. A master coach, she now works with senior executives to drive personal and career change, and with a variety of consumer goods, education, and technology companies to improve their strategic planning and idea development. A Rhodes Scholar with a master's degree in philosophy and an MBA from the University of Oxford, Roopa is also a published poet and world-class athlete in sports riflery. "I was so impressed with The Career Catapult, that I couldn't put it down. It's intriguing, insightful, useful, and very readable."